Original Editors - Aaron Hume from Bellarmine University's Pathophysiology of Complex Patient Problems project. The person infected with Malaria will not present with symptoms until about 7 days to 4 weeks after he or she has been bitten by the mosquito. However, symptoms may not occur until up to 6 months to 1 year after the bite. The bite of a female Anopheles mosquito produces infection and consequent death to erythrocytes, or red blood cells, (see the Plasmodium life cycle in “causes” for more information) which causes hemolysis, anemia, and tissue hypoxia. Symptoms could include fever, chills, malaise, headaches, and myalgia. Cough, abdominal pain, and diarrhea may also occur, but are less likely. Infection by the P. Falciparum parasite produces the most severe form of Malaria and is the most life-threatening. When diagnosed with Malaria, the patient is classified as either severe (complicated) or uncomplicated. 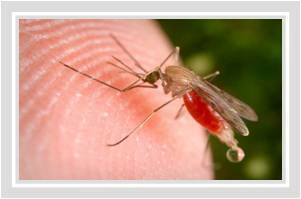 The criteria for diagnosis of severe Malaria is listed in the “diagnosis” section. If infected by P. vivax or P. ovale, the patient may experience relapsing Malaria in which the infection can lie dormant in the body for up to 4 years. Co-morbidities caused by severe Malaria (P. flaciparum) could include cerebral malaria, hypoglycemia, severe anemia, pulmonary edema, respiratory failure, renal failure, and metabolic acidosis. Below is a description of each, and an explanation of the pathophysiology as it relates to Malaria. Cerebral Malaria: This form of Malaria can only be caused by P. Flaciparum. It is characterized by “the intense sequestration of parasites in the cerebral microvasculature.” In other words, the parasite invades the blood vessels of the brain and disallows blood to circulate as it normally would. Furthermore, oxygen and glucose supply to the brain is compromised because of improper amounts of blood flow. Cerebral Malaria causes over 80% of the casualties caused by Malaria. Symptoms of cerebral Malaria include seizures, stupor and focal neurological symptoms. Hypoglycemia: In children, hypoglycemia is caused by the inability of the liver to make new forms of glucose (hepatic gluconeogenesis) because the hepatocytes (liver cells) have been infected. In adults, hypoglycemia is caused by increased amounts of insulin in cells which is a result of stimulation of the islet cells in the pancreas, which are responsible for some insulin production. Metabolic Acidosis: Lack of oxygen to the tissues produces acidosis (High H+ concentration and low pH). The effects of anemia, microvascular obstruction, and hypovolemia (reduced perfusion of the tissues) can cause this lack of oxygen. If it is used for acute malarial attacks it can produce gastrointestinal upset, pruritis, headache, and visual disturbance. c.) side effects: The intravenous dose can cause cardiac arrhythmias and hypotension. The oral dose can cause nausea, vomiting, diarrhea, and hypoglycemia. a.) species of plasmodium: should be used in coordination with Quinine and is most commonly used for chloroquine resistant flaciparum and P. vivax from chloroquine resistant areas. 1.) Uncomplicated Malaria P. Falciparum with Chloroquine Resistance (Countries with resistance include all those that are classified as malarious regions except Central America west of the Panama Canal, Haiti, Dominican Republic and most of the Middle East. 2.) Uncomplicated Malaria P. Falciparum Cholorquine Sensitive (Countries that are Cholorquine sensitive include all those that are classified as malarious regions except Central America west of the Panama Canal, Haiti, Dominican Republic and most of the Middle East. The primary mode of prophylaxis (prevention) for years has been the use of Chloroquine. However, with chloroquine resistance present in most malarious countries, the choice of drug is now based upon whether or not the country is chloroquine resistant. The choice of drug may also rely upon the patient. As mentioned before, some drugs are contraindicated for pregnancy as well as small children. Rapid Diagnostic Tests (RPTs) are used when blood smears are unavailable or examination is delayed. They are based upon recognition of the antigens Histadine Rich Protein 2 (HRP2) and Parasyte Lactate Dehyrdrogenase (pLDH) by dipstick analysis. The HRP2 antigen detects P. falciparum and pLDH can detect any form of Plasmodium. There is no proven or accepted gold standard for the diagnosis of Malaria. However, evidence shows that microscopy is the most reliable test for non-falciparum infections. However, HRP2 showed a high sensitivity (92.7 %) and high specificity (99.2 %) for detecting P. falciparum in Malaria endemic areas. The use of flurescent microscopy with an acidine orange stain has also been proven to be highly sensitive (97.9%) for determining P. falciparum. Vascular: loss of erythrocytes causes hemolysis, anemia, and tissue hypoxia. Sequestration (microvascular obstruction) of infected erythrocytes can cause cerebral malaria (see “co-morbidities” section). Pulmonary: infected erythrocytes can sequester throughout the lungs which could cause respiratory failure because of lack of blood flow and lack of oxygen. Gastrointestinal: Initially, the Malarial infection spreads in the liver killing hepatocytes (see sequence of infection in the "causes" section) which could cause liver dysfunction and possible failure. Hemoglobinuria is caused by the excess hemoglobin left over from destroyed red blood cells. The remnants of the red blood cells are cleaned up by the kidney and released in the urine, producing a dark red color. Repetitive vomitting can also occur in severe anemia. Genitourinary: Renal failure can occur as a result of blood flow obstruction and destruction of red blood cells. Integumentary: Jaundice, yellowing of the skin, is caused by decreased amount of red blood cells and also an increase in bilirubin, which is a product of hemoglobin breakdown. 4.) asexual reproduction occurs within the erythrocyte (immature trophozoite grows into a mature trophozoites) forming more schizonts which again rupture producing more merozoites. The merozoites then invade more erythrocytes. Transmission can also occur by way of blood transfusion, organ transplant, the sharing of needles with contaminated blood, or by congenital means when a mother passes the infection to her unborn baby. Furthermore, “Airport” Malaria can occur when infected mosquitos are transported from a Malarious region to an area not affected by Malaria. Subsequently, civilians of the non-endemic region can be infected by Malaria without having traveled to a foreign country. In 1955 the World Health Organization created a program with the use of Chloroquine and Dichlorodiphenyl (DDT) spraying in an effort to eradicate the disease. However, the disease spread so rapidly that the program was terminated in 1967. Although the disease was not eradicated, death rates declined in the 1970’s because of the effectiveness of Chloroquine, especially in the treatment of the P. flaciparum species. With such a large use of Chloroquine, many regions have became resistant to the drug, causing death rates to soar in the 80’s and 90’s, especially in Africa. Recently, drugs have been developed to be used in chloroquine resistant areas. In clincial trials, Artemisinins have been proven to be effective in combination with other drugs including artesunate-mefloquine, artemether-lumefantrine, artesunate-amodiaquine, and dihydroartemisinin-piperaquine. 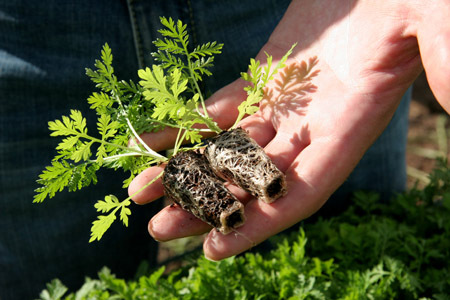 Artemether, a type of Artemisinin been shown to more effective than Quinine (the drug currently used in the US) in the treatment of severe Malaria. Because there has been a great deal of strong evidence to support the use of Artemisinin, it is available for treatment of severe Malaria under the IND (investigational new-drug) application by way of the CDC in the U.S. The FDA has not yet approved the drug and Quinidine is therefore the only readily available treatment for severe Malaria in the US. However, there is strong clinical evidence for the use of the medications listed for treatment of various types of Malaria in the United States. A detailed description of the preventative medications for Malaria can be found in the medications section. The treatments that are listed are those used in the United States. A systematic review proved Atovaquone-Progunil to have a 95.8 % efficacy rate and was proven to be better tolerated and have less adverse side effects when compared to other chemoprophylactic agents. When compared to other chemoprophylactic agents in efficacy, Atovaquone-Progunil was proven to be more effective than chloroquine and mefloquine individually. However, there is insufufficient evidence of Atovaquone-Progunil compared to combination therapies of sulfadoxine-pyrimethamine, halofantrine, artesunate plus mefloquine, quinine plus tetracycline, and dihydroartemisinin-piperaquine-trimethoprim-primaquine in treating malaria. 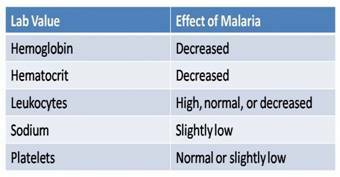 The most important part of physical therapy management of Malaria is the ability to recognize the signs and symptoms of Malaria and quickly refer to a physician for treatment. An efficient diagnosis and treatment can help reduce morbidity and mortality associated with Malaria. Therefore, a physical therapist should always be aware of a patient who has traveled to a Malarious region and Malaria should be considered in any traveler who experiences symptoms of fever within the first year of returning from a Malarious region. However, fever does not have to present to diagnose Malaria. Therapsists should be cognizant of other symptoms of Malaria including chills, headache, malaise, nausea, vomitting, diarrhea, abdominal pain, myalgias, back pain, weakness, dizziness, confusion, cough, and/or coma. A thorough history can help prevent spread of infection and even death. Alternative treatment for Malaria is based upon prevention of infection. Prophylaxis (explained further in “prevention” section of medications) is not 100 % effective. Therefore, to prevent the bite of a female Anopheles mosquito one should always wear long sleeves and pants during dusk in Malarious regions and should also sleep under impregnated bed nets. IRS, or Indoor Residual Spraying, involved spraying insectiside inside houses in Malarious regions. N,N-diethyl-3-methylbenzamide (DEET), an insect repellant, has been shown to be effective in killing mosquitos, thereby preventing the infectious bite. Malaria can be similar to multiple other illnesses because of its common symptoms of fever, chills, headache, and malaise. However, Malaria is considered the most likely cause of fever if the patient has recently returned from travel to a Malrious region. The following are other possible diagnoses. Influenza- The flu is similar to Malaria in that they share multiple symptoms including fever, malaise, headache, and myalgia. However, upper respiratory symptoms are more likely to present in a patient who has the flu. Typhoid Fever- Similar symptoms including fever, headache, nausea, and malaise make it difficult to distinguish Malaria from enteric fever. The diagnosis is likely to be enteric fever if the patient has a history of unsanitary food or water intake as well as gastrointestinal symptoms. Bacteremia/Sepsis- Bacteremia can often accompany Malaria, especially in children and can present with fever, hypotension, and confusion. Dengue Fever- Although this illness, like Malaria, is contracted from a Mosquito, symptoms arise more quickly compared to Malaria (4-7 days). The two infections have similar symptoms, but patients with Dengue fever will likely have a rash, erythema, and bradycardia to accompany fever, headache, nausea, and malaise. Acute Schistoosomiasis (Katayama Fever)- The signs of Katayama fever present about 4-8 weeks after exposure fresh water in a tropical region. Like Malaria, the patient may have fever, headache, and malaise, but will more than likely also present with a rash, urticaria, lymphadenopathy, and blood eosinophilia. Leptospirosis- Similarly to Malaria, symptoms of fever, headache, nausea, and malaise, arise in about 7-12 days in a patient infected with Leptospirosis. However, the illness is caused by exposure to fresh water and the patient will present with a rash. Also, extremely high bilirubin levels could be present in the patient with Leptospirosis. African Tick Fever- Also known as Rickettsia Africae, the Tick Fever can present with fever, headache, and myalgias. Unlike Malaria, it is likely that the patient will have lymphadenitis and inoculation eschars. East African Trypanosomiasis (Sleeping Sickness)- Symptoms of fever, malaise, headache, and myalgia, are likely but the Sleeping Sickness can also present with a red rash because of the bite of a tsetse fly. Also, posterior cervical lymphadenopathy (rash) is a common sign of Trypanomiasis. Yellow Fever- The Yellow Fever, like Malaria, is caused by a mosquito bite in a tropical region and both illnesses have similar symptoms. However, bradycardia can present in the patient with Yellow Fever and symptoms take effect within 3-6 days, unlike Malaria. Congenital malaria in neonates: two case reports and review of the literature. ↑ 1.0 1.1 1.2 1.3 1.4 1.5 Kozarsky P, Nicholls D, Keystone J: Malaria: Prophylaxis. In: Clinical Infectious Disease. New York, New York: Cambridge University Press; 2008: 1371-1379. ↑ 3.0 3.1 3.2 3.3 3.4 3.5 3.6 Malaria. Centers for Disease Control and Prevention Web Site. http://www.CDC.gov/malaria. Updated June, 2009. Accessed March 1st, 2010. ↑ 4.00 4.01 4.02 4.03 4.04 4.05 4.06 4.07 4.08 4.09 4.10 4.11 4.12 4.13 4.14 4.15 Fairhurst R, Wellems T: Plasmodium Species (Malaria). In: Mandell G, Bennett J, Dolin R. Principles and Practice of Infectious Diseases. 6th Edition. Philadelphia, Pennsylvania: Elsevier Inc; 2005: 3121-3144. ↑ 5.0 5.1 5.2 5.3 5.4 5.5 5.6 5.7 Treatment of Malaria in the United States. Centers for Disease Control and Prevention Web Site.http://www.cdc.gov/malaria/diagnosis_treatment/treatment.html Updated June, 2009. Accessed March 1st, 2010. ↑ 6.0 6.1 6.2 Ochola L., Vounatsou P., Smith T., Mabaso M., Newton C.. The reliability of diagnostic techniques in the diagnosis and management of malaria in the absence of a gold standard. The Lancet Infectious Diseases [serial online]. 2006;6:582-8. Available from: ProQuest Nursing & Allied Health Source. Accessed March 5, 2010, Document ID: 1666608351. ↑ You Tube. HHMI -- Life Cycle of Malaria Parasite in Human Host.http://www.youtube.com/watch?v=qvlTOhCmxvY. Accessed Feb 12th, 2019. ↑ 8.0 8.1 8.2 Rosenthal P. Artesunate for the treatment of severe falciparum malaria. New England Journal of Medicine [serial online]. April 24, 2008;358(17):1829-1836. Available from: CINAHL with Full Text, Ipswich, MA. Accessed March 5, 2010. ↑ Malaria Treatment: World Health Organization. http://www.who.int/malaria/diagnosis_treatment/treatment/en/index.html. Accessed April 5th, 2010. ↑ 10.0 10.1 10.2 10.3 Griffith K, Lewis L, Mali S, Parise M. Treatment of Malaria in the United States. JAMA: Journal of the American Medical Association [serial online]. May 23, 2007;297(20):2264-2277. Available from: Academic Search Premier, Ipswich, MA. Accessed April 1, 2010. ↑ Nakato H., Vivancos R., Hunter P.. A systematic review and meta-analysis of the effectiveness and safety of atovaquone-proguanil (Malarone) for chemoprophylaxis against malaria. The Journal of Antimicrobial Chemotherapy [serial online]. 2007;60:929-36. Available from: ProQuest Nursing & Allied Health Source. Accessed March 5, 2010, Document ID: 1372115811. ↑ Patel S, Kain K. Atovaquone/proguanil for the prophylaxis and treatment of malaria. Expert Review Of Anti-Infective Therapy [serial online]. December 2005;3(6):849-861. Available from: MEDLINE, Ipswich, MA. Accessed April 5, 2010. ↑ 13.0 13.1 13.2 Center for Disease Control: Insecticide-Treated Bed Nets. 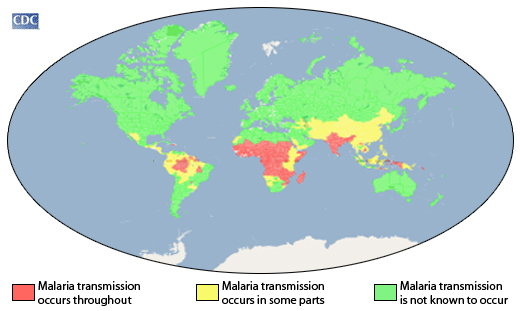 http://www.cdc.gov/malaria/malaria_worldwide/reduction/itn.html. Accessed April 5th, 2010. ↑ D'Alessandro U. Insecticide treated bed nets to prevent malaria. BMJ (Clinical Research Ed.) [serial online]. February 3, 2001;322(7281):249-250. Available from: MEDLINE, Ipswich, MA. Accessed April 5, 2010. 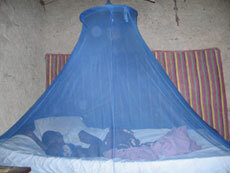 ↑ Enserink M. Bed Nets Prove Their Mettle Against Malaria. Science [serial online]. December 14, 2001;294(5550):2271. Available from: Academic Search Premier, Ipswich, MA. Accessed April 5, 2010. ↑ van Eijk A, Blokland I, Slutsker L, et al. Use of intermittent preventive treatment for malaria in pregnancy in a rural area of western Kenya with high coverage of insecticide-treated bed nets. Tropical Medicine & International Health [serial online]. November 2005;10(11):1134-1140. Available from: Academic Search Premier, Ipswich, MA. Accessed April 5, 2010. ↑ Nothing But Nets.net. http://www.nothingbutnets.net/. Accessed April 5th, 2010. ↑ Malaria No More. http://www.malarianomore.org/. Accessed April 5th, 2010. ↑ Roll Back Malaria: Procurement: Insecticides and spraying equipment for Indoor Residual Spraying http://rbm.who.int/psm/procurementIRS.html. Accessed April 5th, 2010. ↑ Zoller T, Naucke T, May J, et al. Malaria transmission in non-endemic areas: case report, review of the literature and implications for public health management. Malaria Journal [serial online]. January 2009;8:1-7. Available from: Academic Search Premier, Ipswich, MA. Accessed March 8, 2010. ↑ Pomares-Estran C, Delaunay P, Mottard A, et al. Atypical aetiology of a conjugal fever: autochthonous airport malaria between Paris and French Riviera: a case report. Malaria Journal [serial online]. 2009;8:202. Available from: MEDLINE, Ipswich, MA. Accessed March 8, 2010. ↑ Vottier G, Arsac M, Farnoux C, Mariani-Kurkdjian P, Baud O, Aujard Y. Congenital malaria in neonates: two case reports and review of the literature. Acta Paediatrica [serial online]. April 2008;97(4):505-508. Available from: Academic Search Premier, Ipswich, MA. Accessed March 8, 2010. ↑ Roll Back Malaria: Global Malaria Action Plan. http://rbm.who.int/gmap/index.html. Accessed April 5th, 2010. ↑ Malaria Eradicationh Research Agenda.http://malera.tropika.net/. Accessed April 5th, 2010. ↑ President's Malaria Initiative. http://www.pmi.gov/. Accessed April 5th, 2010. ↑ World Malaria Day. http://www.rollbackmalaria.org/worldmalariaday/index.html. Accessed April 5th, 2010.